Singer Aretha Franklin was the undisputed Queen of Soul with a career spanning seven decades, whose feminist anthem Respect is considered by many to be one of the greatest songs of all time. Franklin has sold more than 75 million records worldwide and won a large number of awards, including 18 Grammys, and she was the first woman to be inducted into the Rock and Roll Hall of Fame in 1987. The star was born Aretha Louise Franklin in Memphis, Tennessee on March 25 1942 to travelling Baptist preacher Clarence LaVaughn “CL” Franklin and mother Barbara, an accomplished singer and pianist. Franklin’s family relocated to Detroit, Michigan while she was still an infant. Her father led the city’s New Bethel Baptist Church, which became a centre for the civil rights movement. Following her parents’ separation, Franklin’s mother moved to Buffalo in New York but she would frequently visit her children in Detroit. Barbara died weeks before Franklin’s 10th birthday. At age 12 Franklin had the first of her four sons, Clarence, named after her father, and her second child Edward followed two years later. Franklin’s father became famous for his emotionally charged sermons, becoming known as “the man with the million-dollar voice”. Franklin’s childhood home was frequented by celebrities including civil rights activist Martin Luther King Jr and singer Sam Cooke, while gospel singer Mahalia Jackson helped to take care of Franklin and her siblings following her mother’s death. Franklin’s love and knack for all things musical started early on in her life, when she learned how to play the piano by ear and singing in church. Her father became her manager and she joined him on his tours of churches across the country. She released her first studio album, Songs Of Faith, in 1956 when she was 14 years old. Her first single to land on America’s main industry chart came the following year with Won’t Be Long, but it was in the latter half of the decade that Franklin’s commercial success really soared. Her album of the same name also featured her signature number, a rendition of Otis Redding’s Respect, which topped the chart. Franklin’s success continued into the 1970s with hits such as Spanish Harlem and Rock Steady. In the 1980s Franklin had left Atlantic, but she scored her first platinum-selling recorded in 1985 with her 33rd studio effort Who’s Zoomin Who? Franklin performed publicly for numerous world leaders including the Queen and at former US President Barack Obama’s inauguration in 2009. Franklin was married twice, first to guitarist Theodore “Ted” White with whom she had her third son Ted White Jr, who would later perform as a guitarist in Franklin’s touring band. Franklin’s marriage to White ended in divorce after eight years. Franklin had her fourth child Kecalf by tour manager Ken Cunningham in 1970. In 1978 she married actor Glynn Turman at her father’s church and the pair split in 1984. 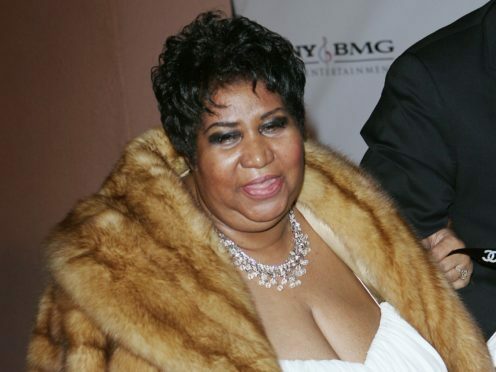 In recent years, Franklin – who battled weight problems her entire life – suffered from ill health and was forced to cancel a number of live shows. In 2011 she said in an interview with the Associated Press that doctors told her that surgery she had for an unspecified tumour would “add 15 to 20 years” to her life. Franklin cancelled two concerts last year on doctors’ orders, including a show in Newark, New Jersey that would have taken place on her 76th birthday. On Monday August 13 it was reported that the star was “gravely ill” in a Detroit hospital. On Thursday the Associated Press confirmed that Franklin had died at her home in Detroit.